Good morning! 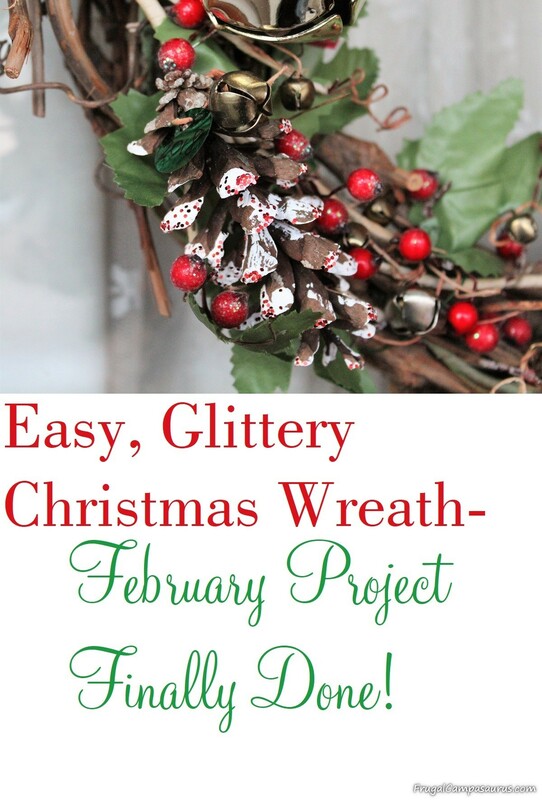 I’m excited to share my February Christmas Challenge project, though I think my kids are probably more excited than I am. 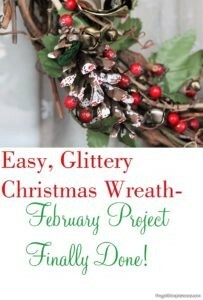 The February project is redoing the front door Christmas wreath. 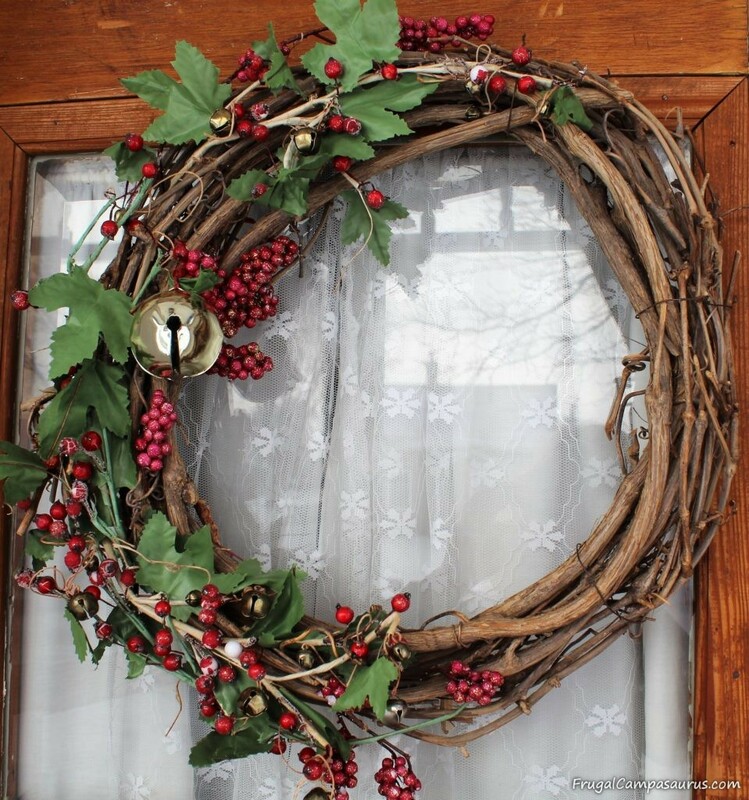 I don’t think the kids are excited because the wreath is beat up-looking from the weather, or because glittery paint is flaking off the berries. I don’t even think it’s because the wreath is the last Christmas thing up at our house, though all of these things are true. I think they are excited to see it change and then get put away, because it has jingle bells. 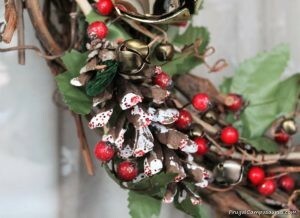 The large jingle bell and many small ones sound so pretty when the door opens during the holidays. But unfortunately, the grandbaby has discovered the jingle bells. Every time they leave our house, the grandbaby must use his fingers to ring the jingle bells, lots of them. If it’s cold and blowing snow, they must ring. If they kids need to be somewhere, they must ring. Whenever the door opens and they carry the grandbaby outside, the jingle bells need to ring. 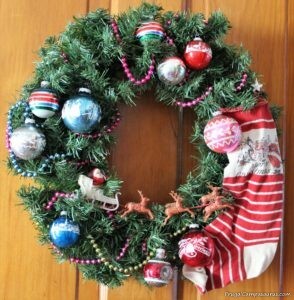 So, I think they will be very happy when I finally finish this Christmas Challenge project (even if it is a few days late, like last month’s project) and put the wreath away for the year. 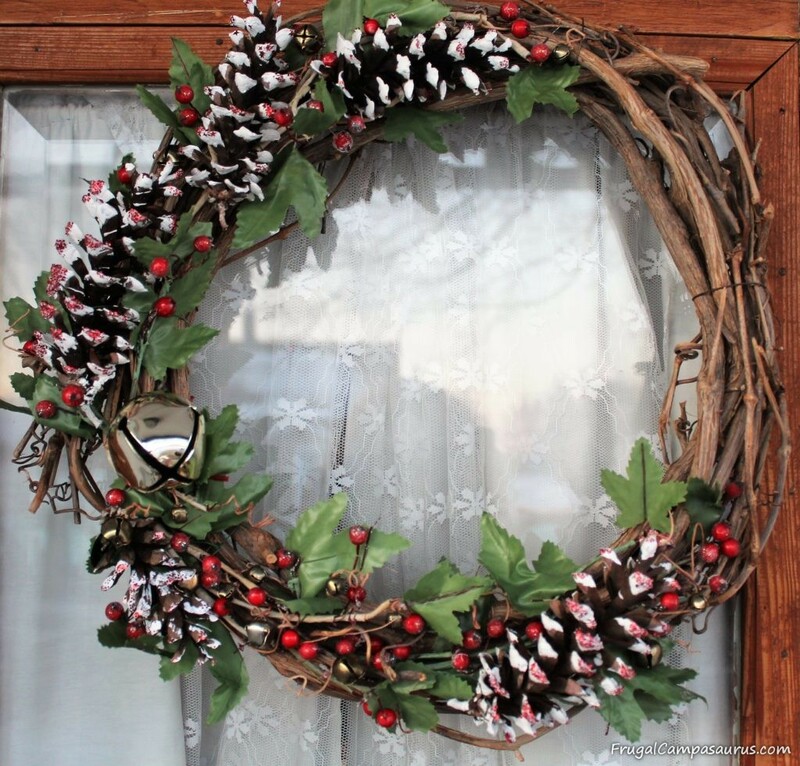 Very neglected front door wreath- definitely a Christmas project! Paint brush was very slow, but the glitter is lots of fun! 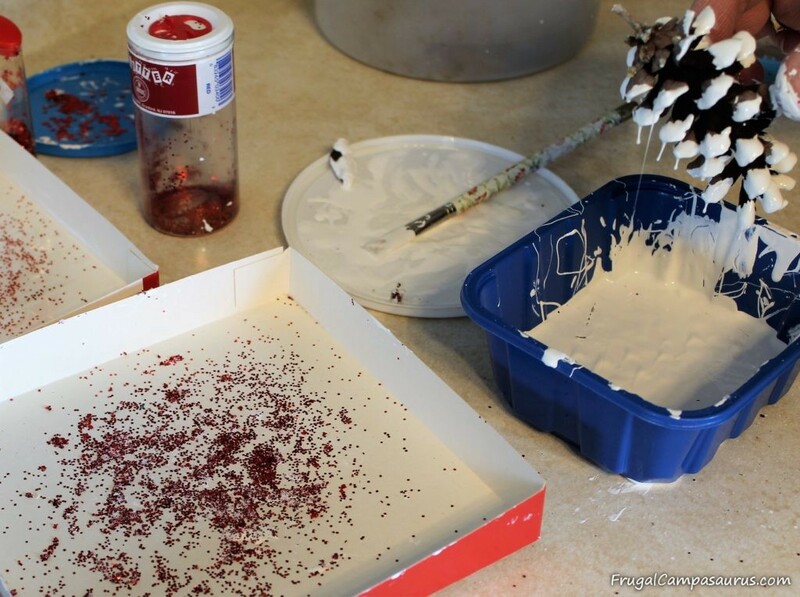 Lots of glitter, lots of fun! I have 3 wreathes. 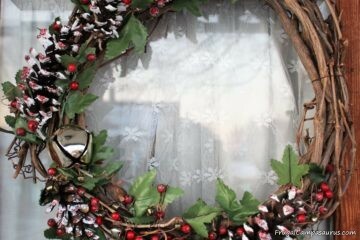 I love my large outside Christmas wreath. It was a $5 thrift store find that I covered with large pine cones. All of the pine cones were from our second South Dakota vacation. Many were from the campground we stayed at, though it was strange hearing the thump of pine cones as they hit the camper roof. 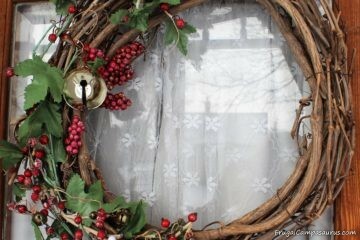 I also love our dining room wreath. It has vintage ornaments from the husband’s parents and my grandpa. There are a few garage sale ornaments, but I redid it this season so that all of the glass beads are from his great-aunt. It is a bit colorful, but very special. Now, only the front door wreath looks neglected, and it is. It has needed fixed for awhile. A few years ago I added more glittery berries, but it still needed redone. It is just too easy to procrastinate. It only took a few afternoons and now it looks much better. I should learn to not procrastinate. The pine cones for the wreath were gathered last fall. Searching for pine cones kept the grandbaby busy while we helped rake leaves. Now, the grandbaby helped paint the pine cones to use on our front door wreath. ‘Sprinkles! Sprinkles!’ Painting was ok, but just like me, the grandbaby loves the glitter! Hopefully, he is not confused when it’s time to bake cookies. As a bonus Challenge project, I made one of his painted pine cones into a Christmas ornament for his parents. It was easy to wire on a few jingle bells and a tag with the year and name. The grandbaby had a fun afternoon, carrying it around and jingling the bells. Not sure if it is still a surprise Christmas present. 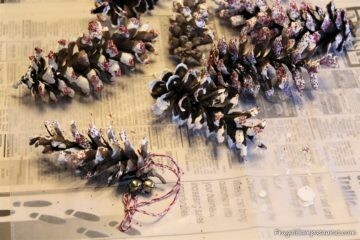 I painted the rest of the pine cones the next afternoon. It was a good thing I was by myself, I ran out of white craft paint. To save money, I used extra house paint or primer- I’m not sure because the label is gone. At least it’s white. And frugal. I’m glad the glitter sticks to pine cones with paint, at least I didn’t have to glue also. 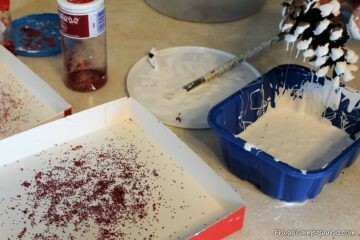 Some of the glitter was sprinkled over all the pine cones, and on some I just dipped the tips into the glitter. There was a definite difference, but I made plenty and the extras can be placed in the Christmas tree next year. Dipping the pine cones was faster than painting them with a brush. But they took much longer to dry. I had to wait to finish the wreath the next day. 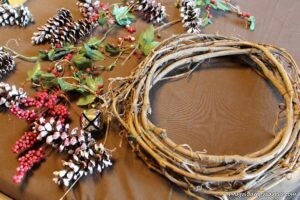 Stripping everything off of the wreath and starting over, made it easier to redo the wreath. It was also easier when I quit trying to conserve the florist wire. Attaching the pine cones just didn’t work with wire that was almost too short. The longer wire, that gave me room to twist and fasten, worked much better. I’m so glad the February Christmas project is done, especially since February is also done. Even though I was a few days late, I’m glad to have a finished February project. If I had waited, procrastination and a hectic holiday schedule definitely would have kept the wreath neglected and sad-looking next year. It will be great seeing the pine cones from the kid’s yard, the grandbaby’s painted pine cone and hearing the jungle bells next holiday season. Hopefully you are encouraged to finish a small project now, like me, while waiting for camping weather! Next Post:Getting Ready for Maple Syrup Time!